6 Steps to Effortless Meditation Success! Below are 6 of the most common complaints regarding meditation. I’ve outlined them briefly, as well as effective solutions for each. Modify these to fit your personal experiences and situations – take what works for you, and leave the rest for another time. I’m Experiencing Restlessness/I Can’t Relax…What Do I Do? If you work all day in an office or cubicle, your body is naturally going to “unwind and unfold”. As soon as your brain starts sending it signals that it’s time to meditate, things can get wonky! You’re quite literally “shifting gears”, just like any other piece of machinery. Your biological machinery is not dissimilar! The key here is to use this to your advantage – especially in Vipassana meditation – by bringing your focus and attention to the very areas which are distracting you. A large part of Vipassana is the focusing of conscious energy on bodily sensations as they arise, slowly recognizing that they are all occurring in the present moment. Everything that’s happening right now is trying to show you that everything can only happen right now. This is one of the higher lessons of Vipassana meditation! Take note of “how” and “where” it “feels”. Allow your focus to fill those areas – be it your feet, hands, legs, shoulders – like water filling a glass. Why Can’t I Find a Comfortable Sitting Posture?! 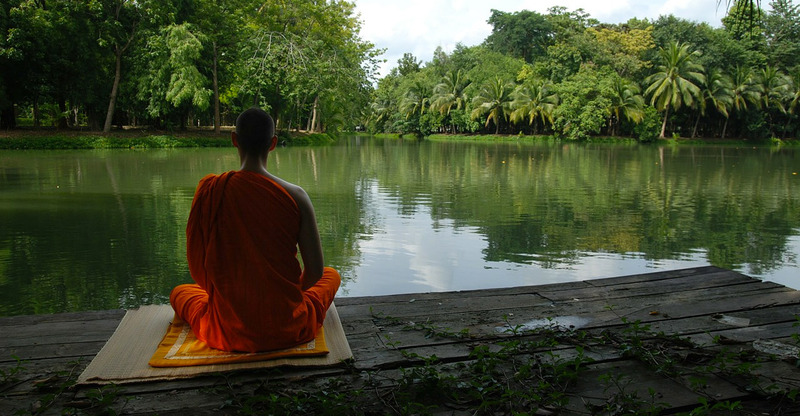 There’s no “right way” to sit for meditation. The only “right way” is the way which works for you. Once you’ve identified a comfortable enough position to begin with – you can always fine-tune it to your own preferences. I tend to favor positions where I don’t feel like I’m spending the majority of my energy trying to get comfortable; that’s the entire point of finding a good posture. You essentially want a position that allows you to feel as weightless as possible. Because of this, I typically start off my clients and students in the Zazen position, and then ask them how they think it could be improved. I’m Having Issues Steadying My Thoughts/Stopping Runaway Thinking/I Can’t Stop Thinking! Continue observing your thoughts as they “cross your mind” – just like sheep jumping over a fence. Your thoughts are just as much a part of meditation as anything else! Part of meditation is learning how to relate to our thinking in new and exciting ways. This is how self-transformation occurs! A large misconception regarding meditation practices is that they involve silence and stillness exclusively. A large portion of becoming aware to the subtleties of our thinking, is learning to work with the natural calmness and serenity your still mind exhibits. At first, your mind won’t like “the lack of noise” – and this is all part of it! This is how you begin gaining access to your conscious core – the True You. Meditation teaches you to stop resisting what’s already happening – a prerequisite for understanding the true nature of reality, your place in it, and how much power you truly have to influence your external world – via balancing and mastering your inner. This is the goal and wisdom of Vipassana meditation – my primary style of teaching and methodology. I Keep Spacing Out! Now What?! This is a sign that your focus is slipping, and it’s time to switch it up a bit. There’s a reason you’re slipping; but what is it? It could be your posture, the temperature in the room, your clothing, etc. I always suggest posture adjustment first and foremost, as many of us don’t realize how awkwardly we’re truly sitting! The main thing to direct your focus to whenever you “get lost” in meditation is your breathing. Establishing a steady rhythm acts as a self-directing metronome; YOU are that metronome! ALWAYS return to your breathing whenever your mind and focus begin to wander; this is the first true test of your mastery of self-remembrance! I’m Noticing Some Emotional Vulnerability Surfacing…Now What? NOW we’re getting to the good stuff! Emotional turbulence during meditation can be due to a variety of things. Most often, it’s your conscious mind and filters relaxing enough, so that portions of your subconscious mind begin permeating through. I know it sounds scary and counterintuitive, but those subconscious layers are where all of your behavior and belief blocks are hiding! When we bring them to the surface – no matter how temporarily uncomfortable – we’re reclaiming our personal power. Those uneasy emotions are stepping stones to higher states of fulfillment, in disguise as temporary discomfort. Solution? The sooner you move through these, the less severe they will become. Like ripping off a bandaid, this can be both uncomfortable, and induce a state of over-thinking – the exact opposite of what meditation teaches! This is also the step where people of all skill sets, backgrounds, and life experience have the most trouble. I Don’t Have The Time to Meditate! Where Do I Start?! Another common complaint. With our busy lives and schedules, how are we supposed to find time to meditate during the day? The solution? You don’t. You don’t “find” time to meditate during the day. You must CREATE time and space for yourself. The simplest and most effective way to do this is to begin meditating 15 minutes upon waking, and 15 minutes before bed. From there, you’ll gradually develop a better sense of how to work it in with your current routine. You’ll also have a very good idea of which areas meditation improves for you, in regards to the way you’re currently living your days. Now, WHY the hell would I do this to myself?! The answer: because early morning meditation out on my deck (with the rising sun) affords me more fulfillment and genuine happiness and contentment than 90% of the “goals and tasks” I work on afterward. Unveiling more of my True Self is my only “job”. Everything else flows and arises as a natural consequence of this. This article is one of those consequences. It’s a secret, and now you know it. Without meditation and tapping into the higher portions of myself, none of my content would even exist. It’s about connecting to the True You, and learning to live with the consequences of that. Meditation teaches acceptance, letting go, and discernment – all of which ironically yield massive rewards just by their virtue of being a constant in your life experience. When you stop worrying about the details of things, you will start seeing things in a brand new way. Entering a state of allowance will transform your life both on the inner and outer planes. Meditation is the gateway back to your True Self; it all begins and ends with you. This article was republished from expandedconsciousness.com. You can find the original post here.